We expose you to the foundations of perception, planning, and control in a fun and challenging environment. Participating teams race vehicles with similar hardware specification and try to outsmart and outpace each other in a battle of algorithms. Compete at CPS Week in April 2019. The early registration fee is $250 per participant. On-site registration is $300 per participant. 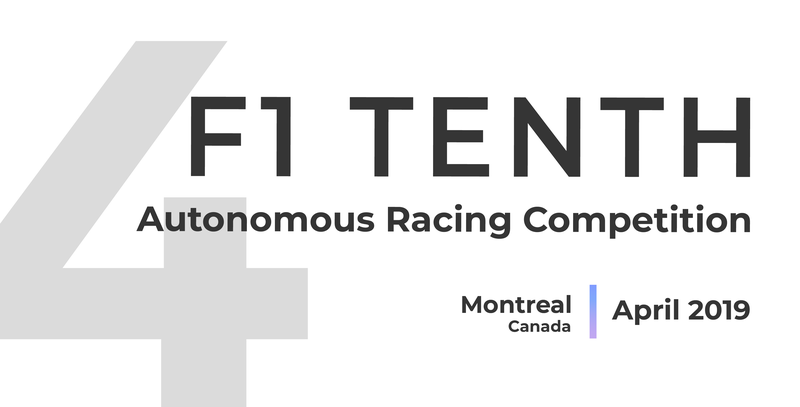 These are the latest rules for the F1 Tenth Autonomous Racing Competitions as of Feburary 2019. Please go over this document in its entirety, as it has significantly changed. A team may participate in both classes, if they choose to do so. It can have 2 different cars, one for each class, or use the same car for both classes (in which case, of course, that one car must meet the restrictions of the Restricted class). A 1/10 scale rally car chassis equivalent to the Traxxas model 74054 > type is allowed. Use this example for reference in terms of dimensions. See further description for restrictions on motor ratings. Four-wheel drive, and two wheel drive versions are both allowed > in this class. Only the use of stock tires, or equicvalent - in size and profile, is allowed. Use of NVIDIA Jetson TX2 or an equivalent capability processor or anything of lower spec is allowed. Use of Hokuyo 10LX or an equivalent LIDAR range sensor or anything with a lower spec is allowed. Multiple LIDARS are allowed, as long as they are all equivalent to, or lower spec than, the Hokuyo 10LX. There are no restrictions on the use of cameras, encoders, or custom electronic speed controllers. Use of Brushless DC motor equivalent to Vellineon 3500 or anything of lower spec is allowed. It is up to the teams to demonstrate that they meet the above specifications for racing in the restricted class. Note: The examples provided are only for reference. The competition is not affiliated in any way with the vendor Traxxas. This is to make sure that it can fit comfortably in the racing track, and that it can compete with other cars in head-to-head race. Only electric drive motors are allowed. That's all! There are no other restrictions on mechanical chassis, sensors, or on-board computers. Multiple heats are held where the goal of each car is to set as many laps as possible with the least (ideally no) amount of crashes. We award both consistency and speed. For each heat (typically 3-5 mins), we will log the number of laps set and your fastest lap time. Multiple heats allow you to change the car setup/parameters to try being more aggressive, or safe. Details about restart procedures, and crashes are announced prior to the race in the practice session since they depend on the track layout. We will place cardboard/foam obstacles (with width and height similar to the restriced class dimensions) in the track at random locations and you need to demonstrate that the car can safely avoid them. If your car collides often with the track or the obstacles, it won't be eligible for head-to-head racing. The code you demonstrate is the code that will race. e.g. you can't demonstrate one code base at slow speed for obstacel avoidance, then run another at high speeds and crash. We understand that the F1/10 head-to-head race is challengeing, it is impossible for the rules to be comprehensive, so we will use 'common sense' to make that determination. For example, if your car appears to be rear-ending another vehicle and causing any perceivable damage, it may be removed from the race. We don't want cars to get damaged.